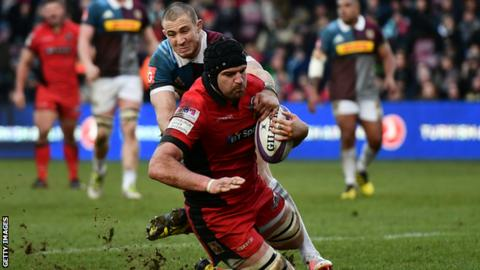 Edinburgh all but sealed a place in the quarter-finals of the European Challenge Cup with an impressive victory at Harlequins. Lock Fraser McKenzie burst through Quins' defence to touch down and Duncan Weir added two penalties to give Edinburgh a 13-6 half-time advantage. Edinburgh's Allan Dell extended the lead, before Quins' Joe Gray crashed over twice for a losing bonus point. Quins and Edinburgh will both qualify with victories next weekend. Edinburgh should go through easily as they host the pool's bottom side Timisoara Saracens on Friday - the Romanians having conceded 203 points in their first four matches. Last season's beaten finalists Harlequins, who drop to second behind Edinburgh, travel to Stade Francais on Sunday, 22 January. Timisoara Saracens and Stade Francais will have to rearrange their fixture in Romania after it was postponed on Saturday because of a frozen pitch. Harlequins: Brown; Yarde, Alofa, Marchant, Walker; Swiel, Care (capt); Murphy, Buchanan, Sinckler, Merrick, Matthews, Chisholm, Ward, Clifford. Replacements: Gray, Jones, Shields, Luamanu, Wallace, Dickson, Jackson, Hopper. Edinburgh: Kinghorn, Hoyland, Dean, Burleigh, Brown, Weir, Kennedy, Dell, Ford, Nel, McKenzie, Toolis, Bradbury, Watson, du Preez. Replacements: Cochrane, Cosgrove, Berghan, Carmichael, Mata, Hidalgo-Clyne, Tovey, Allen.For the latest rugby union news follow @bbcrugbyunion on Twitter.